With the BOR 90 trimaran platform loaded aboard the Ocean Lady on Friday, the shore team turned their focus to getting the wing on board Saturday. It was a delicate operation. 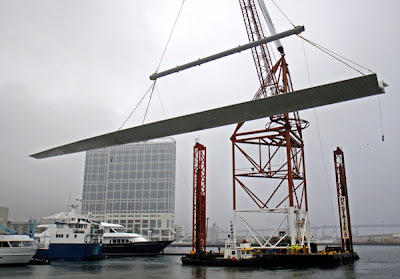 The wing was to be suspended in the air by a floating crane which would then move through the water from the base to where the ship was berthed - several hundred metres away. The wing was lifted well by the crane and the transport phase started. But the weather was far from ideal with heavy rain showers and occasional gusts of wind. During one of these gusts, the load on the wing increased and one of the four straps attaching it to the crane failed. Given this, the shore crew elected to abandon the operation and return the wing, still suspended by three straps on the crane, to the base. "We had a hard time of it today," said Julien Di Biase (SUI), who is overseeing the operation. "The safest thing was to bring the main wing element back to the base and wait for the weather to improve."